I’m facing a possibly serious (okay, I guess it is serious, but something that I hope to get under control quickly, so I can get back to normal again. Normal for me, anyway) health situation that will mean some temporary changes. On November 17th, I had a pain attack that began behind my right shoulder and spread across my chest. I have been short of breath for quite some time now, very tired, no energy, feeling flutters and pressure in my chest, and have been chalking it all up to grief and depression. It appears I was wrong. Since then, it’s been: a trip to the ER, numerous tests, a nuclear stress test (which I failed), a visit with my (new) cardiologist, heart and cholesterol medication…. The pain turned out to be angina. On December 20th, I am due to go through a cardiac catheterization. If they just need to explore, I will be home that night. If they need to insert a stent (or stents) or otherwise perform procedures to fix the issue, it will be a sleep-over. Blockages have been discovered, but until this test is done, they will not know where or to what extent. However, we will know much more after that day, and once that corner is turned, I’ll be looking down the road to recovery, and to getting some of my old stamina and sense of well-being back. Thank you for your patience as I turn down the volume a bit for a little while. I hope to be able to gradually return to more normal levels very soon. We here at “Starling’s Nest” (meaning the whole Nastasi multi-species tribe) wish you all a joyous holiday season, and a happy and healthy 2017! 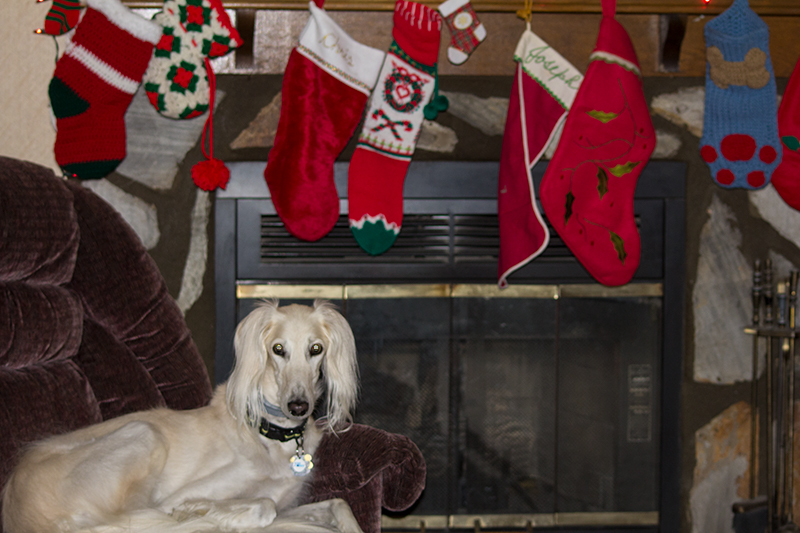 Ryder says: Can you guess which stocking is mine? Praying for your health & healing. Thank you so much, Kelly! Wishing you joy! Hope you start to feel better soon. I have a lot of faith in the medical profession. Glad they figured out what was going on. I will keep you in my thoughts. Thank you so much for the good wishes. Thank you, Susan. I hope you have a lovely holiday season.